Everything you wanted to know about pugs and more! Welcome to the world of Pugs. This is a website dedicated to one of the cutest and most lovable of all dogs. If you're looking for a companion they're a perfect choice. And if you're looking for information about this adorable little dog you've come to the right place. We'll try to answer all of your questions. As cute as they are, we know that this little dog is not for everyone. This site will give a little background information about this breed and also a little guidance on whether this dog will fit your lifestyle or not. We'll also raise some of the questions you should consider before adopting one of these little guys. Already an owner? Great! We'll try to answer some questions about the best way to care for these unique and lovable companions. As you'll find out, this dog has quite a personality. They're natural comedians who love to perform for their owner. They love to be on stage and they love attention. If you're a person who has a great capacity to love and is looking for a constant companion you almost can't do better than this breed. If your interest is in owning a full pedigree dog who can be entered into competitions and shows, then you've made a great choice with this member of the Toy Group of dogs. Pugs, like any other breed, have some unique characteristics. Most of these characteristics make them the adorable dogs that they are. They are very cute. One of the reasons is their facial structure (they're a flat-nosed breed) and their trademark wrinkles and prominent, expressive eyes are almost irresistible. It makes them look absolutely adorable but this facial structure may cause some problems. They have smaller nasal passages and are more prone to breathing difficulties. We say this not to scare you away from this adorable little dog but just to make you aware that they need a little bit of extra care in this area. For example, on a hot day their activities should be a little easier and more relaxed. You should also make sure that they have plenty of fresh water to drink. And, because of their reduced nasal passages, they can have episodes of reverse sneezing. This condition sounds worse than it really is and will usually go away in a few seconds. Almost all Pugs experience this at some point and it can be a little troublesome to the owner. Although it can sound like your little guy might be choking as he stretches out his neck, the episode will usually end in just a few seconds. As with any condition we always suggest following up with your veterinarian. This is just a little sample of the type of information we offer on this website. We'll let you know how you can get access to some of the inside secrets of the top veterinarians. If you’re an owner we'll give you some tips to make your life easier. From dog grooming to feeding and almost everything in between. You should also know that these dogs are shedders. Despite the fact that their coat looks short you'll quickly find out that a Pug leaves a little bit of himself behind wherever he goes. We actually devote a whole section on the shedding problem as well as other things you should know about your dog. We cover the essential supplies that you’ll need as an owner and offer some dog grooming advice as well. We will discuss the basic principles of dog training and correcting behavior problems. The only thing cuter than a Pug is a well trained one and we will provide various sources of training advice. There are some people who believe that the Pug can be a little harder to train than other breeds but we don't agree with that. This adorable little dog may be a little stubborn but they are also quite intelligent and very motivated to please their owners. With that combination of characteristics a well trained Pug should be a within the reach of every owner. We have reviewed many different programs and they are all listed on this site. One of the better ones is a training program specifically designed for the Pug. Please browse through out site to find information on training, nutrition and health concerns. We're updating the site constantly so we like to think that almost anything you wanted to know about the Pug can be found here. We'll share information about clubs and organizations that you will definitely find very helpful. In fact, if you're already a member of club focused on this adorable little breed, please let us know. You'll be doing a great service to other owners because it can be a little overwhelming bringing one of these little dogs into your home. Many people just don't realize how truly social a Pug can be until they're followed around their house by their new family member. If you are looking for a constant companion, a loyal friend and someone who is interested in your every move, you've got the most perfect dog in the world! It won't take you long to realize that these little guys love to eat. Since they can easily become overweight, you will want to know some dietary basics. What are the important factors when it comes to dog food? We've got those questions answered as well. In fact, we have a suggestion on one special snack that is not only healthy but seems to satisfy this little dog’s extraordinary appetite! The bond that forms between these dogs and their owners is amazing and it starts from the moment you meet your little friend for the first time. For many owners that first contact or first bonding experience is how they choose the name that they give their new companion. We love to hear those stories and have a special section on that very topic. If you have an interesting story we’d love to hear it! One topic of special note is Pug Rescue. The men and women who volunteer their time are to be saluted. If you're thinking of getting one of these cute little guys you might want to consider the rescue option. These are dogs in a stressful situation that are looking for a home. There's almost no breed of dog that suffers worse than this one when they are without an owner to love. These dogs are first and foremost, companions. That is what they were born to do. Give them a chance and they'll show you! 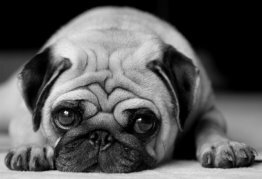 Pugs are very sociable animals and will do almost anything to please their owners. They are, in our opinion, the best companion dogs you can find. A well behaved Pug can make a great therapy dog and they have a great capacity to provide love and companionship. A little research into the history of this breed, which we also cover here, bears this out and you’ll find that they are fiercely loyal to their owner. Josephine’s Pug was willing fight off Napoleon so that you gives you some idea of how faithful this little dog can be. This is a wonderful breed of dog and we never get tired of telling their story. That’s why almost everyone loves a Pug and that’s probably why you found us. Again, welcome! We're glad you're here.